Stop waiting for customers to come to you. Extend the power of your associates beyond the walls of your stores with Arthur. With Arthur, store associates finally have the resources they need to build relationships that result in higher, more frequent customer spending. Arthur has made it easier than ever to create high-touch, visual experiences for our customers. The tool is intuitive, user-friendly, and thoughtfully designed and working with the Arthur team has also been a pleasure. Arthur has provided much-needed transparency into the clienteling process across all our retail stores. With access to messages, we can provide consistent feedback to our employees, which has resulted in better response rates and happier customers. The Arthur team worked with us to create a system that worked best for our store, and our varying store employees and their schedules. Our team's enthusiasm toward customer acquisition also increased since using Arthur, as they work to meet their goals each week. If customers aren't limited to your stores, why are your associates? Monetize your team's downtime and increase customer satisfaction with Arthur's all-in-one outbound retail platform. 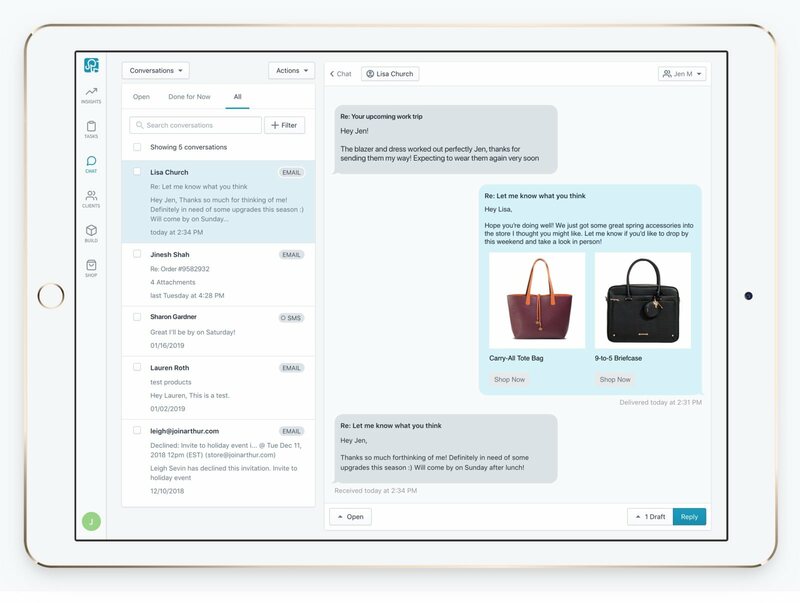 With unified client profiles, centralized messaging, and a custom lookbook generator, your associates will be transformed into digital marketers who know exactly who to contact and when.